The thing is, had they made larger tiles like Warhammer Quest or AHQ or Myth, then sure, you could simply use them without clips. But they have these weird tiles with weird shapes and all those tiny connecting corridor bits... And that fat guy in the video acting as if these tiles are way better than anything else, man, I just can not agree with that. They aren't bad, but they could have been much better. ill be honest i have to agree with sjeng..those clips are bloody awful...now if they had made them from a none slip material or something so stupindly ingenious, then i could understand the nerdgasm..but they aint. So yeah, the tile clips aren't good. You see in this video again that the tiles come apart again half way through the game. It's either not a great design decision or it's not a very good implementation. The clips wouldn't stop me buying the game any more than they would convince me to buy the game. And yeah one of the guys, I think his name is Warren, is really getting into it. I think he just loves dungeon crawling and he makes it quite clear that he is really excited by this. The other guys don't actually look that bothered by it so it's all cool, right? They lay the whole dungeon out at the beginning of the game!! What is that all about. I know a lot of games do this now but I'm just not into it. I feel it takes from away the sense of exploration a bit. I know they don't actually lay out the contents of the room until the players open the door but even so... this just doesn't feel right to me. They have an evil wizard deck. Awesome, didn't we spend a bit of time coming up with our own version of this, so I find this very interesting. But I don't really like the way that it is used as a timer for the game. In the video the players lose the game because they run out of time!! How is this justified? The Heroes come all this way, clear out all the skeletons and zombies, get to the door and then what? Decide that they have been away from the tavern for too long and head back to get a well deserved ale? Seriously, what's the justification here? Because it just looks like a contrived way of letting the evil wizard win. The combat system. I'm really undecided about this. It looks like it works very well and is balanced. By the end of the video I was quite used to it and could quickly pick out the correct result from the two dice rolls but I think that comparing skulls and shields is just, well, more fun. Raising skeletons from piles of bones. I really like this, so much that I think I'm going to find a way to include it in a custom quest pack sometime. The Evil wizard deck (no I just can't bring myself to say 'overlord'). The evil wizard really looks like a competitive player in this game in a way I could only dream of implementing into Heroquest. 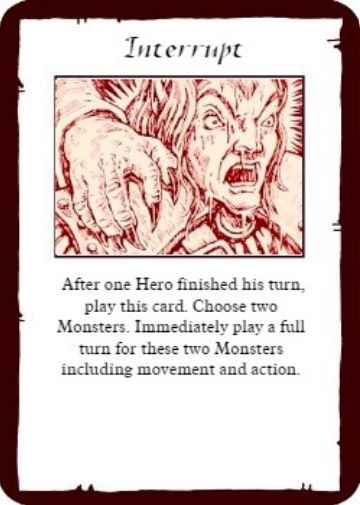 And why didn't we include an interrupt card in our evil wizard deck? Facing for the models looks like it works really well and adds another interesting tactical element to the game. On balance I've got to say that I've definitely seen enough to convince me to pick up the starter pack and take it from there. So what do you actually think about the game? Is Dungeon Saga the HQ25 release we (briefly) hoped Gamezone would provide? How does it compare to other Dungeon Crawlers that are currently available? I am very much awaiting my DS pledge to arrive! From everything I have read and from the kickstarter, The whole dungeon isn't meant to be laid out at the start of the game, only what can be seen, and nothing behind the doors. Also if heroes loose a quest due to "time" the game continues with the next quest and it is meant to have an impact as the quests progress leading up to the final quest. It doesn't always mean a restart as far as I know. And bring on the Twisted Catacomb stuff !!!!!!!! I cant wait to use that in hero quest and also DS ! Now I am interested in the interrupt card and the mob rule, but I don't want to spend my time looking at the video. Good to hear that man tic was able to implement a balance mechanism. Looking forward to copying it for my HQ version. Ah, i've found what the interrupt card does without having to look at the video. Wow, this makes opening doors much more dangerous; and clairvoyance is much more useful. I like the idea of the clips. It means you can easily add your own tiles, easily cut. 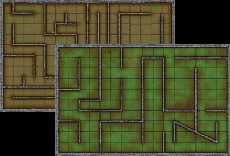 There are, apparently, two modes of play, one with the whole dungeon revealed in advance, one where it is revealed as you go. Woot! My big box o'game turned up last night. I am now the proud owner of Dungeon Saga! Slev what extras did you get through the kickstarter then buddy? I am jealous! I like the fact that the miniatures are already made and the game is pretty much ready to play out of the box! What are the miniatures like to paint howdever? I heard it can be difficult to paint this kind of plastic figure? Anyone know? Please PM me if any of my old links to files are currently down. I am in the process of hosting them somewhere new! Well, to start with, I have the base set and the first five expansions. I got an extra book box (with a different cover and sleeve), four extra Hero minis, a print, and the "dungeon jornal" with extra scenarios, etc. I paid extra for the acrylic tokens, clear red wound markers, 3-d piles of skulls, and the alternative board sections. The acrylic tokens are not brilliant (most are significantly smaller and the markings are not clear), but the range rulers are brilliant. The hearts and skill tokens are excellent (I want more). The alternative board sections do what they say on the tin. I've been painting. Once undercoated, they paint the same as any other figures. If you remind me, I can post details of paint schemes.